A £21 million plan to transform the University of Stirling student experience has been revealed. The Campus Central project has been designed with input from the Students’ Union, staff and local stakeholders. Professor Gerry McCormac, University Principal and Vice-Chancellor, said: “The transformation of the centre of our campus is one of the University’s key ambitions to support the achievement of our strategic aims in learning, teaching and research. Stirling Students’ Union President, Astrid Smallenbroek, said: “The Students’ Union is excited by the University’s plans to transform the heart of the campus, to further enhance the student experience. The development is expected to begin in early 2019, and be completed around September 2020. It will see the refurbishment of the existing Atrium, creation of a three-storey new building, and a re-landscaped, traffic-free Queen’s Court. 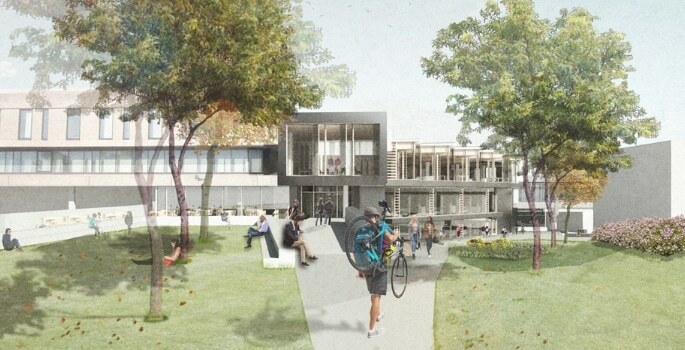 The project will see a new entrance and central welcome area for the Andrew Miller Building, with retail, catering, events space and student support services facilities. It will also feature expanded and enhanced meeting and social learning and study space at the Atrium. The Queen’s Court ground-floor level will provide the gateway to the Macrobert Arts Centre, student support services, meeting and multi-purpose learning spaces. The upper second-floor will house an interdisciplinary, collaborative research space and the Graduate School. More than 3,000m2 of additional floor space will be created to meet the needs of the growing University community, as well as circa 2,500m2 of refurbished Atrium space. The development will improve connections between the loch-side entrance, residences, teaching zone, Students’ Union, Macrobert Arts Centre, Queen’s Court and Cottrell Building. Stakeholder workshops and consultations with students, staff, and other users have taken place and will be ongoing to inform the development of the detailed design and layout. Campus Central also encompasses changes to the transport flow in and around the campus, including the introduction of a new and improved transport hub, minor changes to car parking and new bus routes through the campus.